WELCOME TO BOB'S COINS, YOUR INTERNET STORE FOR SUPER LOW PRICES ON AMERICAN SILVER EAGLES. WE HANDLE ONLY PREMIUM QUALITY NGC CERTIFIED AMERICAN SILVER EAGLES IN MS69 AND MS70. BOB'S COINS ALSO SELL SILVER EAGLE ROLLS. THE AMERICAN SILVER EAGLE IS ONE OF THE MOST POPULAR COLLECTIBLE COINS IN THE COIN HOBBY TODAY. ALSO, SOMETIME JUST CALLED SILVER EAGLES. YOU CAN OWN, A TOP QUALITY EXAMPLE. YOU WILL LIKE THE QUALITY AND THE PROTECTION OF OUR HAND SELECTED NGC (NUMISMATIC GUARANTY CORPORATION) CERTIFIED COINS. NGC IS THE OFFICIAL GRADING SERVICE OF THE ANA (AMERICAN NUMISMATIC ASSOCIATION) AND THE PNG (PROFESSIONAL NUMISMATIC GUILD) AND IS CONSIDERED TO BE ONE OF THE TWO PREMIER GRADING SERVICES IN THE COIN HOBBY. NGC GUARANTEES THE QUALITY AND AUTHENTICITY OF ITS CERTIFIED COINS, GREAT PROTECTION AND PEACE OF MIND FOR YOU. NO REASON NEEDED, NO CALLS, SIMPLY NO HASSLES. BOB'S COINS IS A TOP RATED SELLER ON eBay WITH OVER 8500 POSITIVE FEED BACKS. ON THE MENU CLICK: eBay ITEMS FOR LOTS CLOSING SOON. Or click the link below to go to our eBay store. 1.) HAND SELECTED - PREMIUM QUALITY. ALL NGC CERTIFIED COINS ARE HAND SELECTED TO BE NICE TO HIGH END FOR THE GRADE. BOB'S COINS HAS AN EXCLUSIVE ARRANGEMENT TO HAVE FIRST PICK ON HUNDREDS AND SOMETIMES THOUSANDS OF FRESH FROM NGC GRADED COINS. WE ONLY SELECT THE BEST FROM THESE GROUPS. ALSO, AS THE COINS ARE FRESH FROM NGC THE CERTIFIED CASES ARE PRISTINE NOT ALL SCRATCHED UP. 2.) LOW PRICES. BOB'S COINS SELL ON THIS SITE, eBAY , AND WHOLESALE. AS A NO FRILLS, LOW MARKUP COMPANY WE OFFER SUPER LOW PRICES. 3. )FREE SHIPPING* TO ADDRESSES IN THE UNITED STATES. PLUS, NO HIDDEN CHARGES FOR INSURANCE OR HANDLING. YES, INSURANCE IS FREE. OTHER COUNTRIES CONTACT US. CLICK HERE. 4.) SATISFACTION GUARANTEED. IF YOU ARE NOT PLEASED WITH THE QUALITY AND VALUE OF YOUR PURCHASE , RETURN IN UNDAMAGED HOLDER, OR ORIGINAL CONDITION WITH IN 14 DAYS AND WE WILL REFUND YOUR FULL PURCHASE PRICE. THAT'S RIGHT, NO RETURN AUTHORIZATION NECESSARY, NO QUESTIONS, NO RESTOCK FEES, NO CALLS, SIMPLY NO HASSLE. 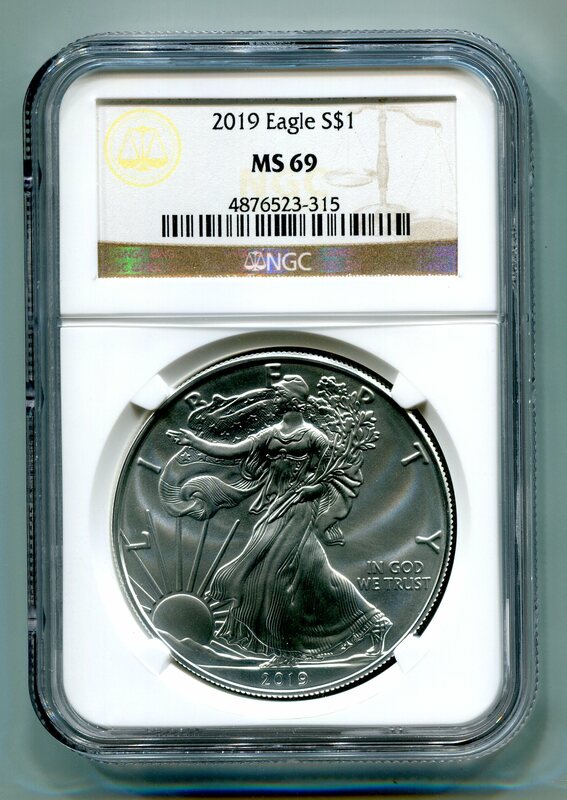 2019 AMERICAN SILVER EAGLE NGC MS 69 CLASSIC ORIGINAL BROWN LABEL, AS SHOWN.